Today, we are excited to share Sanjay and Shefalee’s first leg of the wedding in NJ. They had another intimate beach side ceremony in Jamaica. We were honored to be a part of both the ceremonies. 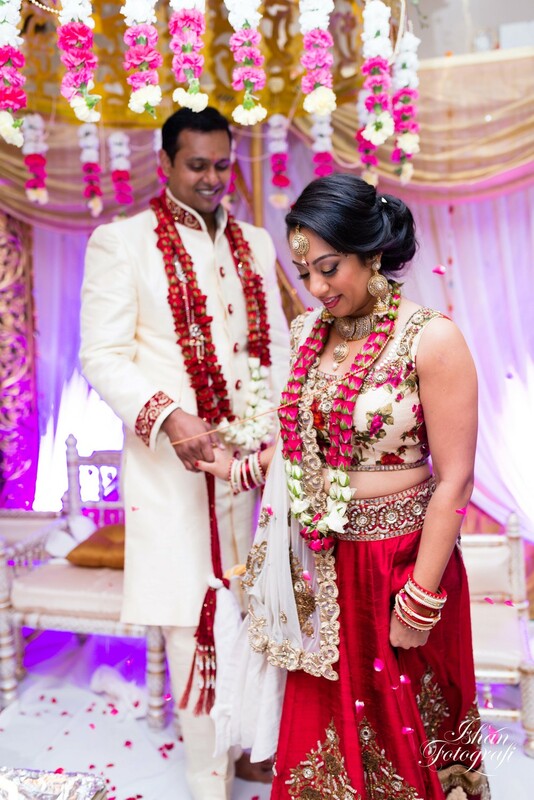 Sanjay and Shefalee’s expressed a keen interest in capturing "first look" before their wedding ceremonies. First looks are very intriguing for the magnitude of emotions that are attached with this moment. The excitement and curiosity of seeing each other for the first time, all dressed up in their wedding attire is simply priceless and what is more exciting is that as a photographer you have the honor of witnessing and framing this. We make sure to photograph these heart warming moments in a private and quiet space, away from the guests and family and away from all the distractions, letting the couple enjoy their last "single" moments peacefully with each other, express their love and appreciation for each other. The results are nothing short of beautiful and excitement-filed photographs. Immediately after the "first look, " we took the portraits of the soon-to-be husband and wife. One of the most important aspects of any wedding day is planning; we invest significant time with our clients to discuss their wedding day schedule to make sure we are able to make the best of the day. Wedding day can be very stressful, but if properly timed and managed a lot can be achieved. Another most exciting and fun tradition that comes to mind when talking about Indian weddings is 'Baaraat.' It is the traditional procession of bringing the groom to the wedding venue. There's live music, a lot of dancing and singing as the groomsmen, family and friends joyously bring the groom to the door. Sanjay & Shefalee’s wedding recessional or as traditionally known as “Bidaai” was quite different than what we are used to seeing. Sanjay is an avid motorcyclist so he found this beautiful motorcycle for the wedding recessional. It is absolutely important that these moments are captured naturally and unobtrusively. This is sometimes very challenging as several family members and friends surround the bride during Bidaai. As a photographers, we situate ourselves very strategically so as to not interfere with the process and yet create well composed photographs. Before the Reception, we got some casual portraits of the newly weds. We thank Sanjay, Shefalee & their families for letting us be an important part of their wedding festivities and choosing us to be their photographers for a very important day of their lives. We will be sharing the pictures from their Jamaican wedding soon, stay tuned!